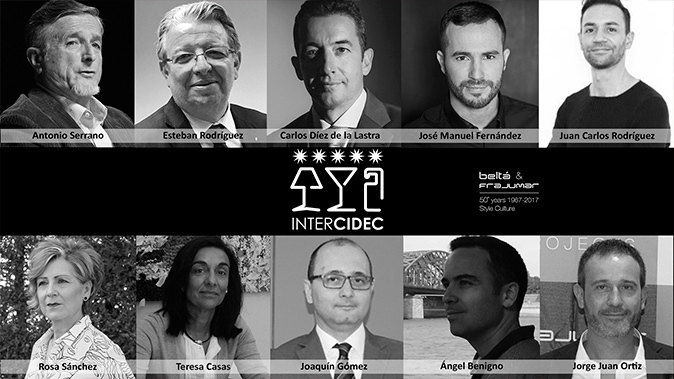 If you participate in INTERCIDEC 2017, you can already know the members of the jury of this edition. Next Tuesday, September 12, the winning projects are chosen. Good luck! Ten professionals from different fields, all related to the world of architecture, interior design, industrial design, communication and hospitality. They will be in charge of deciding who will be the winners of the contest. chief engineer of InterContinental Hotels Group. Since 1989, he has been the Maintenance Manager of the InterContinental Hotel Madrid. In 1995 he was Project Manager of the Reform Project of the InterContinental Hotel in Managua, Nicaragua. Later, in 1998 he was Project Manager of the Reform Project of the InterContinental Princesa Sofía Hotel in Barcelona. In 2000 he is Project Manager of the Reform Project of the Hotel InterContinental Madrid with the company Currie & Brown from Great Britain. CEO and General Manager of Les Roches Marbella since January 2014. Since he took office, he has been focused on consolidating the leadership of the University in Spain in the formation of executives for the hotel and luxury sector, and promoting its continued expansion on an international scale as part of the Sommet Education group based in Switzerland. Executive director of Cuarto Interior. Interior architec graduated at theSchool of Decorative Arts of Madrid, he is in charge of the study with Germán Álvarez (Creative Director). Over the past 20 years they have develope projects in Spain, Middle East, and many other countries, Specializing for few years now in the hospitality sector. Cuarto Interior design homes, offices and commercial premises. Designer of Rockwell Group. His understanding of all aspects about the design and documentation process makes him an attractive and versatile member of the team. Master in Project management and design, polytechnical university of Madrid, Interior design degree, European Institute of design, Madrid Architecture degree, South Anahuac University, Mexico City. From 2012 to 2016 Rockwell Group Madrid, Spain W Oman Muscat, Oman W Hotel Suzhou, Luxury Chinese Colection Changsha, China Embassy Cineplex Bangkok, Tailand Abama Por Ritz Carlton Tenerife, Spain. 2011-2012 Exa SRL Arezzo, Italy Hollister Graz Construction Manager, Austria Hollister Valencia, Spain. Dean of Official School of Interior designers, Barcelona. She has been a member of the governing boards of this school for years and is currently the dean of the Col·legi de Dissenyadors d’Interiors de Catalunya CODIC. She also holds the position of President of the General Council of the Associations of Decorators and Interior Designers of Spain. His studio develops projects of residential interior spaces, contract, retail, in short, spaces where people develop their activities. Their goal is working for society, to improve their quality of life and well-being. Dean of Official School of Interior Designers, Murcia. She has been from her professional beggining developing adaptation projects, reform and interior design, including if the client requires the design of the corporative image. Her projects are made looking for the compenetration with the client, in order to create appropiate spaces to its needs and personality. Dean of Official School of Designers, Andalucia. He has the Applied Arts in the Specialty of Interior Design degree at San Telmo School, Málaga 1978. He has develope more than 250 international projects; small bussinesses, villas restaurants or hotels. President of the Official Association of Decorators and Interior Designers of Andalusia since January 1, 2011. Director of the Instituto de Fomento de la Región de Murcia. Doctor in Business Sciences at the University of Murcia and Engineer in Autonomic and Industrial Electronics at the Polytechnic University of Cartagena. Since March 2015, he was Director of the European Business and Innovation Center of Murcia. He has experience in innovation projects and European projects, where he has participated in more than a dozen of them, and he has published in scientific journals at the international level different articles related to the European Model of Business Excellence. Professor in the Polytechnic University of Alicante. Subdirector of the Construction Area of the Architecture Degree at the Polytechnic School of Alicante since 2013. Extraordinary Doctorate Award from the University of Alicante in 2014 where he is a professor of the Department of Architectural Constructions since 2008 and member of the research group ” Technology and Sustainability in Architecture “. Entrepreneur, partner and commercial director of Belta & Frajumar Group. He has made projects around the world as Project Manager, developing works in more than 36 countries. He works hand in hand with the most important hotel chains in the worls such as AC Marriott, Barceló Hotels & Resort, Palladium Hotel Group, Four Seasons, InterContinental Hotel Group and Meliâ International, among others.